The awesome Matt of Scrubbles burned some old commercials to DVD, and one of them was for these Leggy Fashion Dolls. Man, I don't remember them (they were only out one year, 1972-1973) but I feel like they were so weird I should. They were 10 inches tall and 7 inches of that were legs! Here are some great photos. The Wikipedia entry is written in a very British way, but these were out in North America and Europe both. 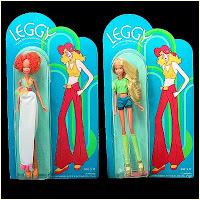 The entry says dolls very much like these were released in 2007 but didn't last either.